3 Amazing Garage Designs to Help You Shape Your Own | McKee-Horrigan Inc. It takes a creative mind to see the garage as a canvass for something beautiful. Rusting bicycles, obsolete electronics, toys abandoned by growing kids and other nostalgia often find their final resting places in the garage, a cemetery for things no longer worth savouring. For businesses, the garage may be nothing more than a storage space for unsightly refuse. This is certainly the case for warehouses that have limited options in terms of storing unwanted machinery or equipment. Maybe you see your garage in a similar light. If that’s so, what would it take to convince you that you can use it for more than junk? What you need is a change in point of view. There are countless stories of people who turn garage door installation into a creative affair. You can do the same. The garage doesn’t have to be the garbage dump that you can’t wait to free up in a yard sale. With that said, you may need to find a way to get rid of excess items if there’s an overabundance of them. But if that’s not the case, you can take steps to turn your garage into something you’ll truly appreciate. Before doing so however, it’s a good idea to see what others have done for inspiration. James Carpenter, a grant-winning light artist and architect in Toronto, added a sparkling touch to Harbourfront’s new garage by means of a dazzling installation. Named “Light Cascade”, the exhibit is a glass wall that stands three-storeys high and 15-meters wide. In addition to lights at the bottom of the wall, the site refracts and channels light into the underground garage through a wide opening, illuminating Ontario Square (A new public space on Toronto’s waterfront). The result is a light show that transforms the dull concrete space of a garage into a visual treat for those who happen to be in or around it. You business owners out there can learn a thing or two from Carpenter’s work. Use light to your advantage, whether it’s day or night. You don’t have to study light art or architecture, but trying something creative with light application can have a dramatic effect on your garage space. This can be true for both homes and offices. Light can alter the mood/atmosphere of a garage space, making it seem less dreary and dark. And the creative manipulation of light can have a practical use as well, especially in places where a lack of light means a lack of productivity. The average office worker is stuck in a cubicle. If they’re fortunate, their backs might face a window allowing them to turn around and look out when they need a distraction. For the designers at Tetro design in Winnipeg, their office space provides a unique alternative. Their workspace was once a garage, which Andrea Tetrault, lead designer and founder of the firm, decided to transform. Before, it was an old service garage in west Winnipeg’s Historic Exchange District. Guided by a vision and design-oriented instincts, Tetrault realized that the 2,400 sq. ft. space would accommodate her team’s need for space and most importantly, their need for inspiration. Can all warehouse and industrial facility owners do what Tetrault did? No. But there’s still something to learn here. 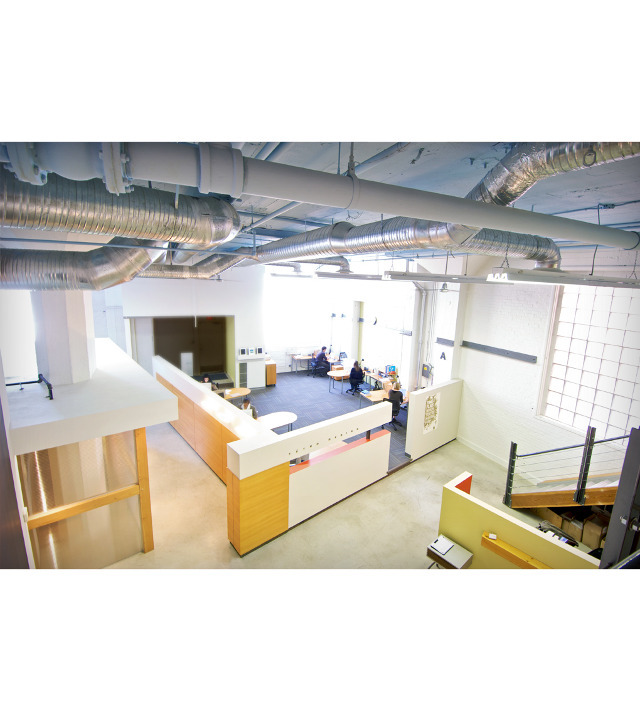 Depending on your industry, you may use an industrial space for a non-industrial purpose. In such a case, you don’t have to retain that old, worn-down appearance just because you’re dealing with commercial garage doors. You can dress up the space by revamping it’s lighting, colours, arrangement and even invest in new garage door installation to make it look more inviting. Again, these are not mere design concerns, since an old warehouse may actually need physical maintenance if it is to remain functional. When was the last time you frolicked in your garage, and what for? Was it to add waste items to a growing pile of trash? Or was it to look for an item you lost years ago? Whatever the reason, there’s a good chance it wasn’t for pleasure. Mieka West, a resident of Calgary, decided it was time to fix the gravel and tar roof of her garage. The job was one she and her husband had put off for years – the $8,000 replacement cost being one of the reasons. However, her creative side struck when she decided to transform her garage into a space that’s reminiscent of a solarium. Keeping the roof beams intact, Mieka and her sister added a clear roofing material that could withstand hail and snow. The result was a more open, sun-lit garage that turned into a perfect summertime R&R spot. Your garage doesn’t have to be a dim and dull resting place for unwanted items. You can turn it into a room that has a more meaningful purpose, especially for the summer. Another interesting thing to note from West’s example is the fact that her garage idea was the result of wanting a cheaper alternative. Don’t feel defeated if your budget won’t allow you to carry out a repair job you think is necessary – a more creative solution may come from nowhere. Also, applying a unique design with your residential garage doors can significantly raise the value of your home. Most people will continue to see their garage, whether it’s at home or in business, as a storage unit. They might not see much potential in it at all. But looking at the examples mentioned in this post, you can see that there are quite a few people who have thought differently. You can join them too. In fact, if you’re looking to revamp your home or business space in some fashion, consider the possibilities of creative garage door installation and renovation! Not only may you create something that’s both aesthetic and functional, you might save yourself a good bit of money too. Looking for advice concerning garage door installation? Get in touch with us so we can assist you!